Officially opened to trekkers in 1990 and just as suddenly forbidden again, the region around Mt Manaslu, the eighth highest mountain in the world at 8163 m was finally "re-opened" in 1992. This trek offers much more than mountains. Starting in the lush green lower hills, inhabited by Indo-Aryan Hindus you will pass through the middle hills, inhabited by the Tibeto-Burmese Magar, Rai, Limbu and Tamang peoples who follow both Hinduism and Buddhism and sometimes Shamanism, to emerge into the high, arid desert region that is actually a part of the Tibetan Plateau where people of Tibetan Stock dwell and where the predominant religion is Tibetan Buddhism. The changes in predominant cultures is evident, even from the names of places. While names such as Gorkha, Arughat Bazaar and Setibas are names rooted in Indo-Aryan languages, Nyak, Namru and Somdu are typically rooted in the Tibetan language. These same observations can be made, only travelling in the opposite direction, after crossing the Larkya La. Tanbuche, Karche and Thonje are Tibetan names while Naya Gaon and Besisahar have Indo-Aryan roots. Going north, up the river valley of the Buri Gandaki and then behind Mt. Himalchuli (7893 m.), Peak 29 (7839 m.) and Mt. 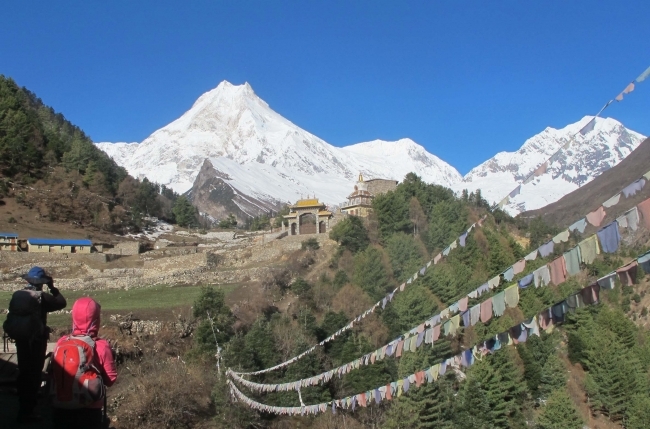 Manaslu (8118 m.) to cross the Larkya La (La = Pass) at 5213 m., this fascinating trek explores areas and villages where westerners are still a very rare sight and the way of life unchanged for decades and maybe, even centuries. Strenuous trekking is constantly rewarded with brilliant mountain vistas of the Ganesh and Manaslu Himal ranges and insights into the cultures of a cross-section of ethnic Nepalese tribes and peoples, perhaps not available on any other trek. Your journey into this remote and once forbidden area of Nepal begins with an overland journey to the the town of Arughat Bazar. From here the trail heads north up the Buri Gandaki river valley the trail passes through the villages of Khani Gaon, Setibas, Nyak, Namru and Samagaon to cross the Larkya La (5213 m.) and then joins the river valley of the Dudh Khola (Khola = river). From here, the trail heads south to the Dudh Khola"s confluence with the Marsyangdi River at the village of Thonje and continues through the villages of Chyamche and Nayagaon to Besisahar from where you drive back to Kathmandu or contunue on to Pokhara. During certain seasons it may be possible to raft down from Besisahar to the road head at Dumre before driving back to Kathmandu for an additional charge. Please be sure to let us know if you would like to have this extension. This trip is long and strenuous and the crossing of the Larkya La requires excellent physical conditioning, acclimatization to the high altitude and of course good weather. Day 01 Arrival in Kathamandu.Depending on the arrival time of your flight sightseeing of Kathmandu. Day 02 Last minute preparations for your trek, or if you are sufficiently prepared sightseeing of Patan Durbar Square, Swoyambhunath and Bodhnath. Day 03 Drive to Arughat Bazaar (570 m.). Day 05 Camp near Soti Khola (880 m.). Day 06 Trek to Khani Gaon (890 m.). Day 09 Trek to Bhir Gaon. Day 14 Above the remains of Larkya Bazar. Day 16 Rest Day at Bhimthang (3680 m). Day 18 Trek to Dharapani (1920 m.). Day 19 Trek to Besisahar (760 m.) Overnight at lodge. Day 20 Drive to Kathmandu. Day 21 Spare day in Kathmandu to allow for delays during your trek. This day may also be utilized for additional sightseeing. Day 22 At an appointed time, transfer to the airport for your departure from Nepal.